When confronting an enemy in battle, the structure of the roman advance was to have the legion's soldiers in a line marching forward with their shields raised facing the enemy. They would be the first to do battle against the enemy soldiers. At each end on the flanks would be the Auxilia. Their purpose was to protect the legion's soldiers from any attacks from the side. Behind these two would be the cavalry. Soldiers on horseback with longer swords ready for action once the infantry had played their part. The main plan of attack would be for the Romans to position themselves at the top of a rise, thereby forcing the enemy to run up the slope towards them. When they were about 30 metres apart, a trumpet would sound in the Roman ranks and this would be the signal for the legionaries to release their two javelins in quick succession. The visual effect of several thousand javelins in the air at one time was terrifying to the enemy, causing them to stop and crouch with their shields above head height to protect themselves from these missiles. This would be difficult as the enemy's ranks further back would still be pushing forward, so causing a concertina effect of bodies. When the javelins landed, the sharp points would pierce the shields and the softer shaft would fold under the impact. This would render the shields useless as they could not be carried with such an awkward tangle of wood and metal embedded in them. The enemy had no choice other then to throw down their sheds and attempt to battle without them. This in turn would obstruct the enemy as there would no be a hedge if shields and tangled metal around them. 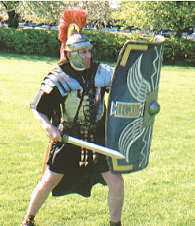 The Romans would then close ranks with each soldier holding his shield in front and looking over the top. They would then charge towards the enemy in a wedge shape formation. When the two armies met head on, the legion soldiers would thrust their shields forward into the enemy (usually the face) thereby rendering them off balance and often with a serious injury. They would then move their shields to one side and thrust their swords forward into the soft areas of the opponent. The sword would be withdrawn and the shield brought forward ready to be thrust into the next opposing soldier. As they went forward the roman soldiers would stamp over the enemy in their hobnailed caligae thereby causing more injury, even death. Once the enemy had been routed and in disarray, the legion soldiers would step aside, as their were not pursuit soldiers. The cavalry would then come forward and ride amongst the enemy soldiers slashing and stabbing at them from horseback. The enemy by now was in complete chaos and those that did not run were either killed or taken prisoner. The cavalry would pursue those that ran fort one purpose. To kill or capture. The Romans did not allow anyone to escape, as they would be able to fight another day. They believed in total victory by destroying the enemy's fighting power completely. The Ermine Street Guard showing just what made the Legions so powerful. They would wait for the enemy to come close, then as one they would take a step forward and thrust their scuta into the bodies of faces of the enemy, causing them to lose balance and so render them vulnerable. 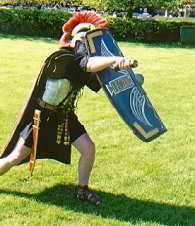 The scutum is then withdrawn and the sword (gladius) is thrust into the body of the opponent. 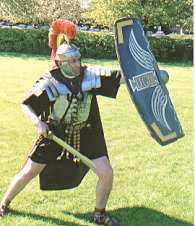 Note the way in which the gladius is deployed horizontally to pass between the enemy's ribs into his vital organs. The legionaries would advance in a line towards the enemy thrusting scutum, then gladius. It was this action, scutum, gladius, scutum, gladius that would disorientate the enemy and take their front warriors out of the battle. The landscape of Britain was completely different to the European terrain. 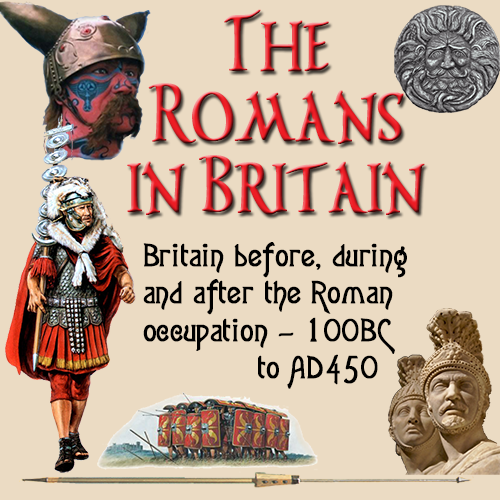 This caused many problems for the Romans as they marched through Britain, conquering all who opposed them. In the South-East and Anglian regions to the east, they encountered relatively flat ground on which to fight their campaigns. However, once they spread west and north, the regions they encountered became more hilly and difficult to travel across. The tribal inhabitants took full advantage of the geography and built hillforts on top of the highest and most strategic areas. This presented problems for the Romans as it became increasingly harder for them to transport their heavy artillery to the battle site. The Romans had techniques for dealing with enemy forts and strongholds. First they would lay down a barrage of artillery fire from their two main weapons, onagers (wild asses) and trebuchet. The former was a catapult type weapon and the later was similar, but based on the slingshot in it's operation. Both weapons were powerful and effective as they could hurl a 150lb (68kg) rock a distance of 200 yards (183m). Such artillery would pound the walls of the enemy's camp and smash down the walls. It did not matter if they fell short or went over the wall, as the missile would either roll along and damage the wall, or land inside the stronghold and wreak havoc on landing. Then they would use siege towers or battering rams to break down the entrances. The rough ground would prevent these weapons being deployed, so the Romans used another, equally devastating, piece of machinery. 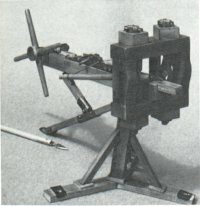 The ballista. This was very much like a giant crossbow that could also fire rocks and metal balls, but it was usually used to fire bolts with arrow shaped heads made of iron. This was a much smaller weapon and easier to transport. It also had a longer effective range of 400 yards (366m). Archaeologist have found evidence of them being used at Maiden Hill, Hod Hill and Pilsdon Pen. There would be several ballistas placed around the fort, each firing their deadly ammunition with remarkable accuracy towards the target. The enemy had no choice other than to take cover or risk death from these deadly missiles. Once the ballistas were in action, and they were firing consistently over the walls, the Romans sent in their soldiers using a technique called the tortoise. The testudo was a method of gaining access to the enemy's entrances with the minimum of risk to the advancing troops. A group of 27 men would form up in four ranks. It was usually the same men in each testudo as each had to know exactly were he was to be placed. Then they would raise their shields in a set pattern. The outer men would have them by their sides and the ones in the middle would hold the shields above the heads of all in the pack. As little flesh was exposed as possible, and the shield would overlap to avoid any openings in their armour. This made a protective shell around the soldiers. They would then crouch down and walk steadily towards the target as a uniform unit. Missiles, javelins and arrows returned by the defenders would bounce off the shields. On arriving at the gates of the fort, they would either used a small battering ram to break open the doors, or set a fire to burn them down. If there was more than one entrance, then a testudo would be deployed for each one to ensure maximum effect. When the defences had been breached, then more soldiers would advance testudo fashion into the complex. Once inside, all hell broke loose as the Romans would slaughter without mercy all those inside. Men, women and children were savagely hacked down, regardless of age or threat. They were the enemy, and they must die. The Romans did not let any adversary escape. They were either killed or taken prisoners of war. This was prevent an escaped enemy warrior from returning to fight another day. Prisoners of war were given the choice. Spend the rest of their days as slaves to the Romans, or become gladiators for the satisfaction of their new masters.